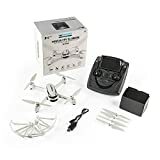 Hubsan X4 H502S Drone Review 2019 – is the Hubsan X4 H502S quadcopter worth the money? Review of features, pricing, flight duration, battery, camera and more. Advanced GPS functionality for even better positional accuracy. In the past few decades, drones were principally used by the armed forces for surveillance, and other military uses. However, today drones are increasingly becoming popular among hobbyists around the globe. Aerial photography, geographical mapping, and real estate are just some of the fields that have embraced the use of drones. Realtors and photographers seeking to advance their careers should consider investing in a drone. This Hubsan X4 H502S Drone Review sheds light on one of the most capable drones under $200 on the market to date. Hubsan has been one of the leading innovative companies in the drone manufacturing industry. Though the Chinese drone-maker has enjoyed a lot of success with toy drones, it’s their professional X4 Quadcopter series will excite many potential buyers. The Hubsan X4 H502S is one of the flagship professional drones in the X4 series lineup, together with the H501s. This easy to fly drone is specially designed for First person view (FPV) exploration. The H502s sports a modern and minimalistic design and is manufactured from lightweight materials. 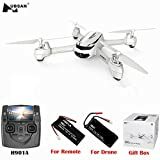 Hubsan has done an incredible job of equipping the X4 H502s with a quality body construction while keeping the price affordable. First-time drone pilots looking for a high-quality drone at an affordable price will love this drone. • GPS navigation system- the GPS feature adds autonomous flight modes which allow the controller to capture any content of interest with minimal controlling. • Headless mode — this mode counters loss of orientation. When activated, the drone will automatically fly relative to you regardless of which way its front or back is pointing. • Altitude hold mode — the drone has barometric sensors which allow you to fly it at fixed heights. Activating this mode allows you to fully focus and zoom in on your subject without having to worry about losing or gaining height. • Automatic return to home (RTH) feature — in case you lose contact or control of your drone, pressing the RTH button allows the air vehicle to trace its way home using GPS. • Follow me mode — this feature allows the drone to capture your every move as you do cool stuff such as running or hiking. What is the actual charging time for this unit? This drone’s battery takes roughly 150 min to recharge. How do you switch between modes 1 and 2 on this unit? The procedure on how to go about it is outlined in the transmitter menu. Does the unit support Micro SD card? Yes, the unit does support MicroSD cards of up to 16 GB. Design: the drone’s bodywork is made from tough plastic which protects the interiors in case of malfunction. The emergency parachute system also adds extra protection; when deployed it allows the controller to safely land their aircraft if it starts falling from the sky. Its built-in GPS system allows the controller to fly it accurately when filming. Camera: of all the features in a drone, the camera is one of the most important because its responsible for capturing footage and pictures. The Hubsan H502Smakes do with a 2 megapixel 720p HD camera. Its camera setup can record video at up to 30 frames per second. The standard camera does not have a stabilization feature, but for a few extra bucks you can get an advanced set up with the stabilization feature. Range and flight time: The drone has a beefy 610mAh Li-Po battery which keeps the aircraft flying for just over 12 minutes. The drone has a decent flight range that maxes out at 250 meters. Switching to the FPV mode reduces the range to about 150 meters. It’s wise to turn the Return-To-Home feature if you exceed the 100-meter range. 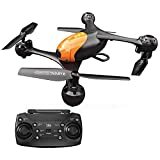 While the H502s is a decent drone with its 720p camera and brushed motors, the H501s is a definite upgrade and boasts better specs such as brushless motors and a more capable 1080p camera. However, you will have to pay 90 to 100 dollars more for the H502s. The Bugs 3 drone sports brushless motors, a high voltage 7.4V 1800mAh battery and an average flight time of 18 to 20 minutes. These specs the MJX bugs 3 drone more powerful, more responsive but costlier than the H502S. The XK X250 with its black and red color scheme is quite a looker. Its specs are comparable to the H502s. It has a 6-axis gyro, headless mode, and one key return. Its 800mAh battery translates to a flight time of 10 to 12 minutes. 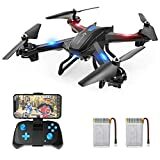 Consumers are particularly impressed with the fact that this drone manages to have a modern GPS navigation system, a feature common in more expensive models. The return-to-home feature is also a favorite of many people, and it works flawlessly as long as the battery has enough power. The controls are easy to use, and the instructions are pretty straightforward. Some users have reported having issues with the battery and interference as the drone approaches its maximum range. The Hubsan H502s offers some fantastic features that many first-time drone pilots will enjoy. Its follow me, return home, and the GPS navigation based system makes it an absolute steal at its price tag. Though there are drones with 1080p and 4K HD camera units, its 720p HD camera can still take decent photos. 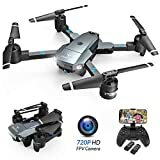 I would gladly recommend it to anybody looking for a budget-friendly drone under $200.